Lincoln based uPVC and aluminium fabricator, Sternfenster, has recently announced its plans to open a new factory exclusively dedicated to the production of aluminium windows and doors in 2015. The decision follows the continuous growth of the aluminium business experienced by the fabricator ever since entering this market, almost three years ago. Sternfenster’s managing director, Mike Parczuk, commented: “We’ve had very strong sales for our aluminium range over the last few years and it made sense for us to pursue this business opportunity. We have actually expanded our aluminium department several times in this period. At the same time, our uPVC division is stronger than ever and keeps growing with the addition of new machinery and staff to supply the increasing demand. This year alone the company has reported a 28% increase of the aluminium business since January. These results were achieved thanks to a strong customer service programme, complete with a dedicated technical department and extensive marketing support which continues to help its clients seize the opportunities of a growing market. Sternfenster is currently operating from an 80,000 sq. ft. production facility in Lincoln, supplying the full range of Smart Aluminium products, including the Visofold 1000 bi-folding doors and Shopline commercial doors and shop fronts. A wide variety of casement windows is also available from the Lincoln fabricator, such as the Alitherm Heritage 47 window system for heritage and renovation applications and Alitherm 600 and 800 casement windows, designed for excellent thermal performance. Mike added: “Our plans prove we’re in it for the long haul and our aim is to constantly supply our clients with high quality aluminium windows and doors at reasonable prices, and to satisfy their increasing demand whilst keeping our customer service levels up and our lead times down. Moving the aluminium department will also enable Sternfenster to further expand the production for its successful Residence 9 window. Thanks to a revolutionary development in the R9 manufacturing, the fabricator’s sales for this product have recorded a 48% increase. 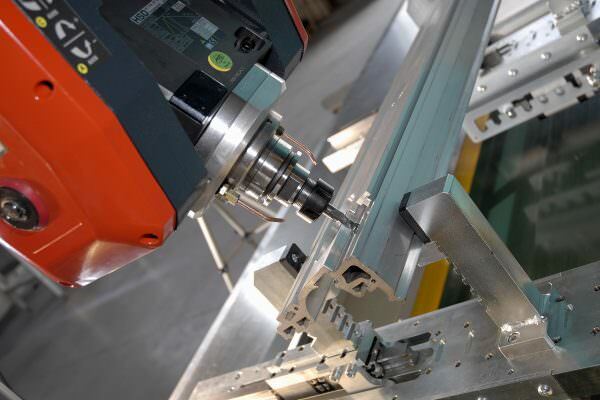 Sternfenster is the only UK fabricator to produce Residence 9 with a unique, seamless corner weld, as a result of sustained investments in state-of-the-art machinery. The fabricator has obtained all planning permissions for the new facility, and construction is set to start at the beginning of next year.